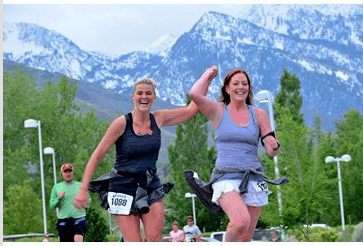 If you're planning to run a half marathon in Utah, don't miss out on these races which are consistently rated the best by those who have run them. As they say on their website, of all the half marathons in Utah this might be the only one with zero turns. The Utah Valley race has a diverse amount of scenery along the way, including downtown Provo as well as breathtaking views of waterfalls, mountains, and other natural features along the US 189 highway. There's nothing quite like running among the tulips! Hopefully they can give you some flower power on this half marathon, which starts and ends in Electric Park and extends through Ashton Gardens, home to 250,000 tulips as part of the annual flower festival. The course is beautiful but challenging, and don't expect a PR. It runs through the gardens and includes more than 5 miles of paths through the Thanksgiving Point Championship Golf Course. There are rolling hills which are both steep and plentiful, and the course twists and turns. Also be ready to run on everything from asphalt to gravel to cobblestones. This is a small marathon through stunning Dry Fork Canyon, and it's a ton of fun. One of its unique features is the Sprintasaurus Competition where, for a half mile stretch, runners can sprint as fast as they can and the fastest person (determined with chip scanners) wins a prize. The course is fast, easy and well-marked, so plan on finishing with a new PR. Expect a good amount of downhill as well as some rolling hills. This half marathon has a stunning backdrop, the V-shaped canyon, and runners will be distracted by the beauty of sites along the way, including Big Cottonwood Creek and the Historic Old Mill. The real party starts at the finish line though, with fun for the whole family. The course is primarily downhill, so this is an ideal race "for the rookie half marathoner and a great way for the experienced runner to achieve a new PR", according to the official site. The beginning elevation is at 7,700 feet and ending elevation is at 4,700 feet. There are a handful of flat spots, and some grades up to 7 1/2%. This may be a new event, but the inaugural edition in 2015 was a huge success, so you can bet it's here to stay. Participants in this fun ladies-only race are encouraged to come dressed as either Thelma or Louise, the race medal is a belt buckle and, as an added bonus, the water stop at mile 1.5 is a "Brad Pitt" stop. This means that it's manned by men all dressed in jeans, a white t-shirt and a cowboy hat, like Pitt in the movie. As the official website says, "There are sure to be fast times as this course is FLAT, FLAT, FLAT!" This out-and-back marathon extends beside the Colorado River on Highway 279. It starts and ends at the Gold Bar Campground. This half marathon "takes you through Utah's spectacular Bryce Canyon National Park, a geologic wonder that lures visitors from around the world with its incredible red rock formations, stunning views of amphitheater-like canyons like Inspiration Point, and wide-open skies", according to halfmarathons.net. It's also worth noting, though, that the race starts at an elevation of 7,652 feet, so runners who aren't used to the high altitude should consider this before signing up. This is a relatively fast point-to-point course. It is flat and mostly downhill, although the second mile is gradual uphill and there is a slight incline at mile 12. The total elevation loss is 1,800 feet. Spectacular views await in Parowan. This event, one of the state's most beautiful, kicks off at the Yankee Meadows Reservoir, in Dixie National Forest, home to spruce, juniper and maple trees, not to mention stunning rock formations, like Vermillion Castle, and ends downtown. This is a gradual, long downhill run with a total elevation drop of around 2,300 feet, and it's an excellent high altitude event to prepare runners participating in full marathons in the coming months. As with many Utah half marathons, this one takes in a place of notable beauty, culture and history. From the spectacular red rocks and the real dinosaur footprints along the race route to Buckhorn Panel, one of the world's biggest Native American pictograph panels in the state, this stunning run is one-of-a-kind. The course is flat and downhill, with a few gentle rolling hills. It begins at 5,656 feet above sea level and ends at 5,100 feet, according to the official site. If you're looking for something different, then you don't want to miss The Haunted Half. Join thousands of other runners, dressed up in costume, for this event in Salt Lake City. It's fun for the whole family, with picture booths, bounce houses and face painting. It begins in Emigration Canyon, extends towards Sugar House Park and continues along Haunted Lane until the end. This race has a downhill and flat course. It's fast and fun, and the perfect run for achieving a PR.